Hey! My kids are 9 & 6 and getting into anime and manga (the 9 year old). I'd like to show them some Miyazaki movies. There are a few I have in mind but having a tough time finding a way to watch them. Do you all have any suggestions? I was only into Dragonball at their age but I'd love to help them experience some of these great films. I'm not much of a movie guy and I never really have been, I won't deny that Miyazaki's a bit of a blind spot for me. That said I absolutely loved Kiki's Delivery Service as a kid and Howl's Moving Castle as a teenager. Been said twice already, but gotta third Kiki's Delivery Service. Honestly you're probably just gonna have to buy them physical. There aren't really any good ways to watch them digitally as far as I know. Also, don't forget about Castle in the Sky and Naussica. Those ones are absolute classics. Marnie might also be too much. What gender are they since boys tend to like more actiony cartoons. Totoro, Ponyo and Kiki are solid list. Others are better to wait for a year or two. Mononoke is for mid-teen and save Graves for last because it is really heartbreaking. Castle of Cagliostro is pre-Ghibli but a good watch and is on Netflix. I still don't feel old enough for Grave of the Fireflies. @naltmank Agree, Spirited Away is only for the 9 year old. @mbun Yea I've heard of that, I'm interested to watch that one myself w/o kids. I've recently downloaded a bunch of them off RARBG. VLC is perfect for subbed films. Its not legal technically but its easy and the quality is great. Ponyo is a good start because it has animals and is visually striking. Kids love that stuff, you'll reel them into anime. Maybe warm them up with Finding Nemo, aha. VLC is perfect for subbed films. I can't speak to your experience and maybe it's gotten better but I haven't used it in almost a decade at this point because it was really, really bad back then. I dunno what the 10,000 IQ anime experts use but MPC-HC has done me well. Yeah, I don't like VLC either. That video is funny. MPC-HC isn't getting updated anymore, but I'll keep using it until it's no longer compatible. What do you guys think of "Howl's Moving Castle"? I saw the promo last week and thought I might take my 9 year old daughter. Also, what is the best collection of the movies to get? I remember Damiani saying there is a best and worst version on the stream last week. @travelingsnowman Howl's Moving Castle has fantastical characters, but I think it is aimed for a slightly older audience with everything going on in that movie. Hard to detail without spoiling anything. Not as intense as Princess Mononoke, but a level under that. what is the best collection of the movies to get? I have no clue. I think he was saying the old DVDs for the ones Disney had rights to distribute in the States, because the Bluray versions had worse music or something. 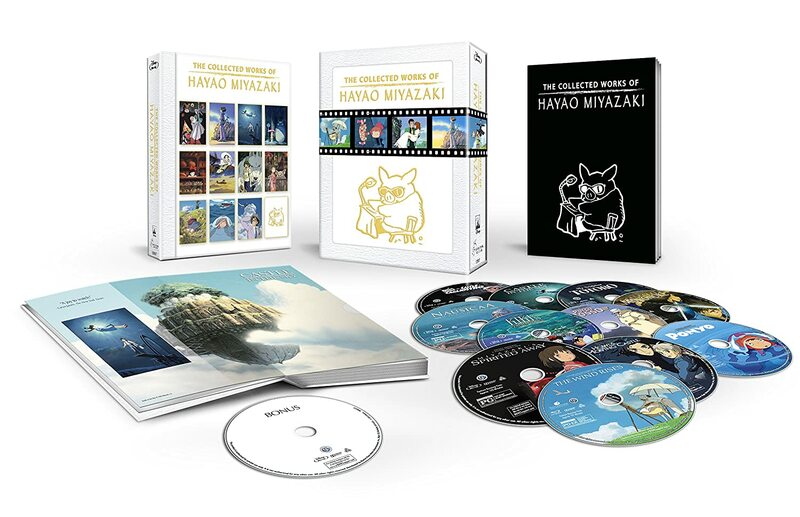 All I know is the best Ghibli Collection is absurdly expensive, and I don't think you'll find it in any stores stateside. @travelingsnowman Howl is personally my favorite Miyazaki movie, and I probably saw it around 9 so It's definitely not innapropriate or anything. It's much more of a slow burn if I remember correctly, so don't expect a lot of excitement right out of the gate. I upgrade my Ghibli DVDs to BD from time to time. Since the Disney deal has ended, I can get ones with 7-10€/a movie. I always watched them subtitled with japanese audio and even if they are usually in mono instead of stereo, I still prefer them that way. I also like Miyazaki's movies better that came out before 2000 but I wouldn't say later ones are bad or anything and even Spirited Away got an Oscar thanks to people recognizing the anime being a big thing from there on. Do GKids release them on BD now there since Disney deal is off or are they only doing theatrical releases? Gkids has the blu rays now, and IMO they look and sound better than the Disney releases. I think they scanned them from restored original negatives in many cases.